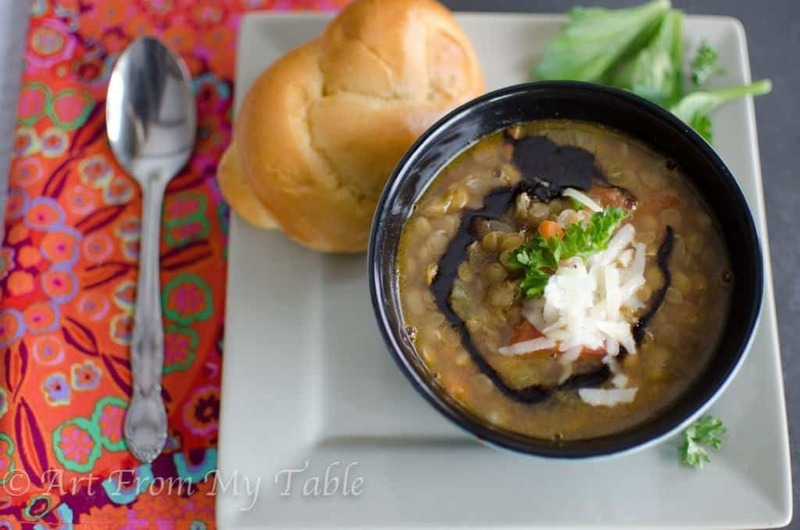 Protein packed lentils and delicious vegetables, this easy lentil soup recipe is bathed in bone broth and finished with a splash of balsamic vinegar. I crave a hot bowl of goodness on these frigid winter days. A bowl of White Bean Soup warms me from head to toe, it’s thick and delicious, not to mention healthy. I also love a good bowl of French Onion Soup, so easy to make at home! 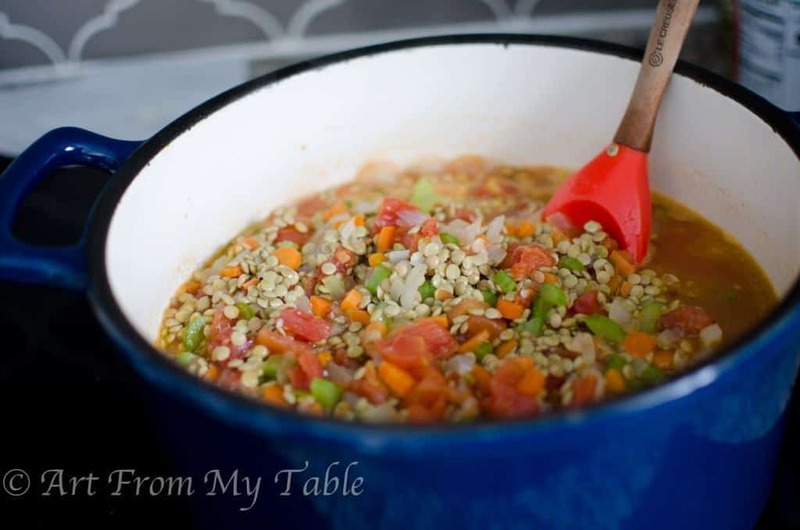 But today, it’s all about this easy lentil soup recipe which feeds my craving perfectly. It’s filling, yet it doesn’t leave you overly full feeling. You will be completely satisfied with this soup. It makes a perfect meal all by itself, or a really nice addition to your main meal. It’s super healthy, which besides how good it tastes, is what I love about it. I wish I could take credit for this amazing recipe, but I can’t. I found this is in one of my favorite books, Bread and Wine: A Love Letter to Life Around the Table with Recipes , by Shauna Niequist. I’ve adapted it slightly. Not only is it flavorful, but it’s really easy to prepare. Make a big pot of this and it’s ready to go for quick lunches or dinner. Make meal time effortless by prepping this ahead of time and all you have to do is warm it up. Serve it with a quick salad, or some dinner rolls. That being said, this is a meal that comes together quickly. If you eat lentils regularly, you might even have all the ingredients already. To start out, you’ll saute’ the vegetables about 15 minutes. Then add the broth, lentils and tomatoes and simmer for about 35 minutes or so (see complete instructions in the recipe card below). Dinner in under an hour, plus, you will have leftovers!! Eat it during the week, or freeze it for later. One more thing I do to ramp up the health benefits of this easy lentil soup recipe is use bone broth. Bone broth is made by cooking the chicken and or bones for a really long time and it breaks down the bones and you get all kinds of extra nutrients that you wouldn’t from ordinary broth. Every time I roast a chicken, I make broth after that meal, and I stock it in my freezer. It’s great for your gut and has healing benefits. Here’s a great article that talks more about that. Enjoy your soup! May it warm you from head to toe! Oh, and don’t leave out the vinegar, it really takes this dish over the top!! 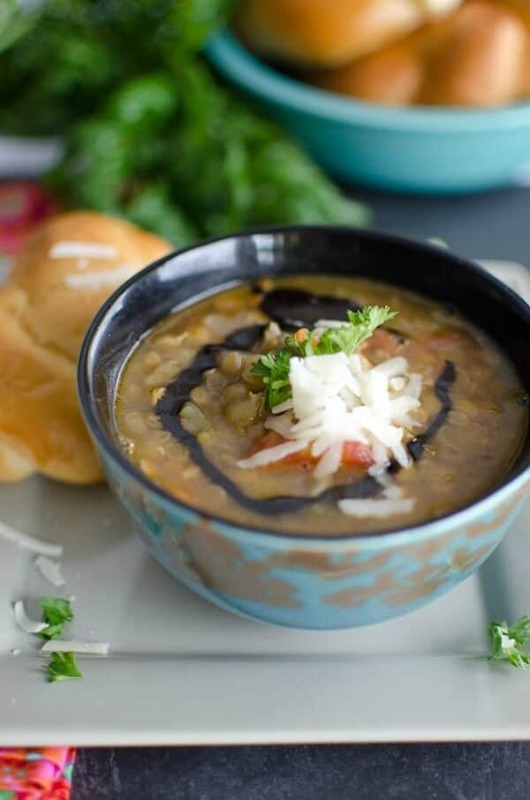 Protein packed lentils and delicious vegetables this lentil soup is bathed in bone broth and finished with a splash of balsamic vinegar. Heat oil in a heavy large sauce pan or dutch oven. Add onions, carrots, and celery, saute' until they begin to brown, about 15 minutes. Add broth, lentils and tomatoes with juice and bring to a boil. Reduce heat to medium-low, cover and simmer until lentils are tender, about 35 minutes. Slow Cooker Instructions: Saute' the vegetables, then transfer to the Slow Cooker and add the rest of the ingredients. Cook on high for 2-4 hours or low for 6-8 hours. Instant Pot Instructions: Turn the Instant pot on the "Saute" function. Saute' the vegetables. Add remaining ingredients, close lid to the sealed position. Press the soup function and set for 20 minutes. Quick release and serve. We love soup! Especially hearty, but quick ones. I’d think you’d love it. BTW, great party, keep it up! We use lentils in chili and other soups, but I have not made a soup with lentils as the feature. This sounds delish and I love leftover soup to warm up later. I bet the balsamic gives it a unique taste, I love balsamic! Pinned! Oooh, lentils in chili! I must try that one, thanks for the tip. Yes the balsamic really adds alot! 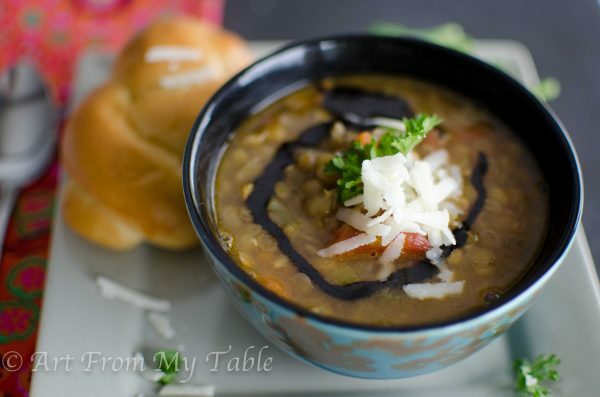 This lentil soup is Amazing, the whole family loves it. I’ve made it 3 times in the last month! Thanks Chellie for all your recipes. You made my day Kim! I’m so happy to hear this and glad it meets all the needs of your family.